Some more juicy real estate rumors for some of the most high-profile space in the Sloop. On a subsection of developer Crescent Heights' website (page is now not available), an image has appeared on a page labeled Michigan & Roosevelt, promoting an upcoming development for what is currently a vacant lot. Although the rendering, which only shows the lower floors of a new tower, could just merely be a placeholder design for the purposes of the webpage, the image could also very well be a sneak peek of the proposal said to be designed by well known architect Rafael Vinoly. If the rumors turn out to be true, this would be the first major high-rise project for Vinoly's firm to be located in Chicago. Crescent Heights currently lists the proposed tower as 1255 South Indiana Avenue, and is rumored to rise 70 floors. According to the high-rise watchers on the SkyscraperPage forums, the tower could rise up to 835 feet to the top of the parapet and 862 feet to the top of a decorative roof structure. If the building does indeed climb to that final height figure, it would be the tallest all-residential building in Chicago, provided nothing more than simple ground floor retail space is also included in the building. The Crescent Heights webpage also lists 30,000 square feet of retail and 1,900 units, although it would be highly unlikely for these figures to be for only one tower. 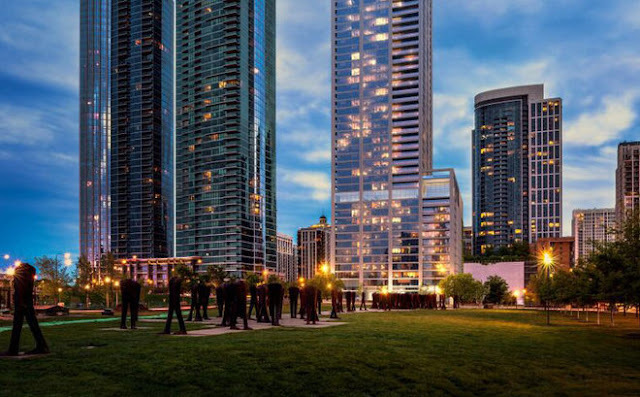 A second building is expected to be constructed at the southeast corner of Michigan and Roosevelt and as such, the figures could be inclusive of both towers as well as any nearby land holdings which could be considered as part of a phased project. This specific lot has been the subject of much speculation around the interwebs and here at Sloopin. Reoccurring renderings for "The Chicago" has been at the center of this, but frankly a lot of that has been suspect. With that said, this seems the most realistic especially since it's on the website of the owner of the land. It's just a matter of time until something goes up. Hopefully it will be interesting.